We have wide range of products. We offer an exhaustive gamut of bags that serves a useful purpose of business trips, family outings and others. We manufacture the bags in standard sizes however, Our wide range of bags is available in elegant and exclusive designs and styles from the shoulder fit style to trolley pattern that meet specific client requirements. We are engaged in offering an impeccable range of Guitar bags /Covers. These are highly useful in protecting guitars from dust, moisture or physical damage. Moreover. These rexin soft cases also facilitate the musician in carrying his guitar to different places by placing the bag on the shoulder. Good Qaulity Hard Wearing, Dampproof, Heat resistant, Double laminated Denim Bag. 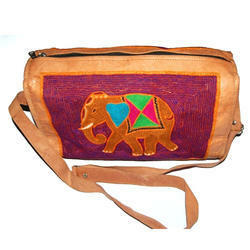 Owing to devoted experts, we have been competent to present a wide range of Dholak Bag. These products are made as per industry norms and standards. Size/Dimension: Length 52cm, Bottom Diameter 13cm, Width 16cm.